HOUSTON — Alberth Elis scored his 11th goal of the season in the 94th minute and the Houston Dynamo made it stand in the second extra period for a 1-0 victory over Sporting Kansas City on Thursday night. Houston, which is undefeated in its last seven games, advanced to the Western Conference semifinals to face the Portland Timbers. Vicente Sanchez dribbled alone along the right side, cut back his defender to get inside the 18-yard box near the end line and found Elis alone at the penalty spot for a calm finish. The Dynamo improved to 13-1-4 at home this season. Sporting KC, winless in its last six matches, was again without one of its best players in goalkeeper Tim Melia, who went down with a hamstring injury on Oct. 7. Backup Andrew Dykstra started his fourth game of the season and denied Sanchez’s penalty kick on the final play of the game. 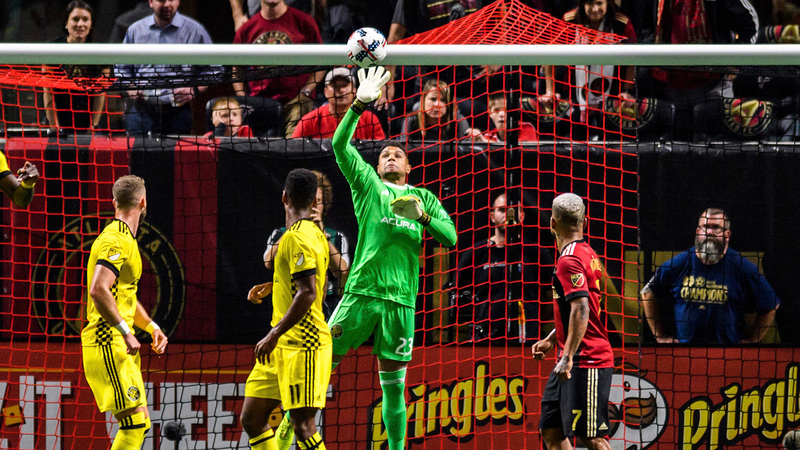 ATLANTA (AP) — Zack Steffen made a career-high eight saves and Columbus advanced in the MLS Cup playoffs by besting expansion Atlanta on penalty kicks in front of a MLS playoff-record crowd of 67,221. It was the second knockout-round game to reach extra time in MLS history after Portland and Sporting Kansas City went to penalty kicks in 2015. Steffen dove to his right to deny the opening penalty kick and Federico Higuain scored for the Crew. Atlanta’s second attempt went directly to Steffen as he stood tall in the middle of the goal and Jeff Larentowicz hit the post on United’s fourth try. Adam Jahn won it for the Crew after entering as a substitute in the 120th minute. Columbus, which is unbeaten in its last 11 games, advanced to play New York City FC in the Eastern Conference semifinals.